A youtube video from a commercial plane dated Jan11/11 apparently somewhere over Indonesia shows vast areas of farmland flooded and evidently from the ocean as the shoreline appears to be greatly encroached. Looks very much like land sinking and I've never seen a video like this before with the ocean responsible for the flooding except in tsunami cases. Where news reports can clang the insistant message that the flooding is coming from rain causing rivers to overflow their banks, this video clangs the truth far louder. The flooded land is open to the sea, and the Java Sea stands at the same level. Only sinking, or a recent and slow draining tsunami, would create such a visual effect. If a tsunami was the cause, then where are the reports of this? The degree of elevation loss can also be calculated from this video. The approach is from the east, in a plane landing in Jakarta. The companion video, titled "landing in Jakarta" has the same crying baby and even shows the airline insignia on the wing tip. As is clearly identified in the companion video, a major freeway or toll road is flooded on both sides, showing how far the inundation has progressed in Jakarta itself. Only those who have taken the route of denying it all would fail to be impressed by this evidence, notably made available by a private citizen who questions the establishment explanation for the flooding. Irregular flooding can be seen, such that all spots on a certain elevation are not sinking at the same rate. For instance, in the video coming into Jakarta, dated January 11, 2011. The flooded land can clearly be identified by the shape of the coastline and the rivers, but this land is supposedly relatively high elevation, only the very coastline subject to flooding even with a great loss of elevation. Yet Jakarta is shown as very vulnerable to a drop in elevation in the Google maps. The companion video, "landing in Jakarta", shows the plane passing over a freeway on January 11, 2011 nand approaching the runway. 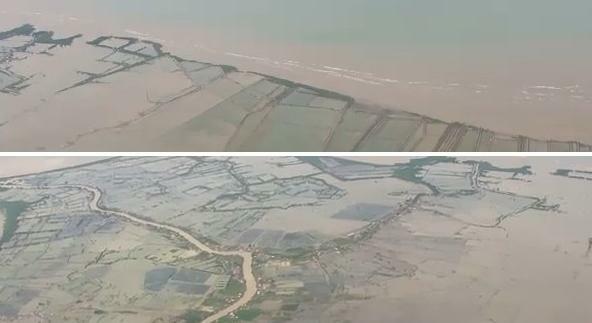 The lands between the airport landing strips and the Java Sea are clearly lowland, and well flooded as seen from the video, but the airport landing strips are not flooded. This would be equivalent to a 10 foot drop in elevation for Jakarta. 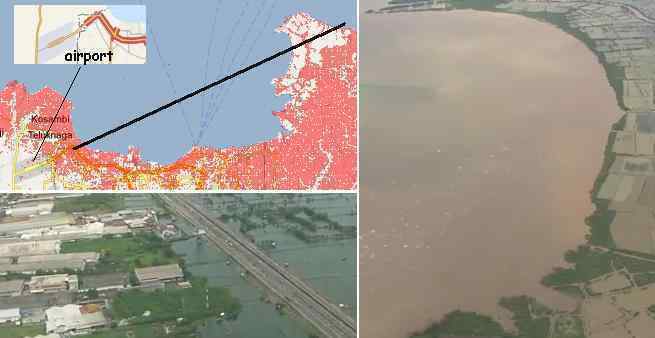 Lands further to the east of Jakarta suddenly experiencing sudden inundations from the sea at Subang and Indramayu on January 18, 2011. If the northern coastline of Java had a 10 foot elevation drop on January 11, 2011 these lands would have already been flooded. So why would the peninsula show so much flooding, yet not Jakarta? [and from another] Floods in Subang and Indramayu [Jan 19] http://berita-komunitas.blogspot.com/2011/01/ 11 600 houses were flooded on two districts in the Coast North of West Java . Yes, floods hit the coast north of West Java, seven districts in Indramayu district and two districts in Subang January 18, 2011. Around 5,000 houses submerged in Indramayu and about 1,000 residents were evacuated. In Subang, 6665 floods submerging houses and 1614 hectares of rice fields. Water levels rose rapidly. How accurate a guide are the current elevation maps provided by Google and GPS? If they reflect land that lies on solid rock, on a plate that will remain level and not tilt, accurate enough. But as we have explained, Java and Sumatra are land that is rubble, scrapped up as the plate tongue has been pushed down in the past. It is an illusion of solid land when rubble can jumble and toss. The placement of Jakarta in the past involved some logic, as tests were made to determine if the rock beneath could sustain buildings. But sinking is occurring there, not admitted in the press. At some point the airport will become unusable. In addition to the issue of solid rock vs jumble, there is the issue of the accordion folding of the plate tongue. Some parts will rise, others sink, and this will not be an even process nor even predictable. Thus Google will not be a certain guide to what lands will sink or stay above the waves. 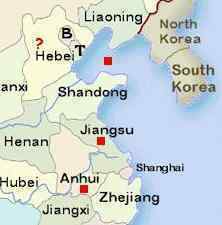 The three earthquakes happened in Huang sea, Jiangsu Province and Anhui Province, China. Although their levels are not high, these sites are not in the seismic activity belt. What do you explain for it? The quakes happened from east to past. I wonder whether the plate is in the process of fracture? If so, where is the next site? Hubei Province? [and from another] I also noticed that China has experienced more frequent earthquake in the past two weeks than before, many of those earthquakes happens in Sichuan and Yunan province, close to North Eastern tip of Indo-Australian plate border. Several earthquakes also line up around the same latitude with Huang Zhou. Also several sinkholes have been reported in Sichuan province in the past two weeks. From the recent Pakistan earthquake and intense earthquake in Indonesia and New Zealand, we see the active plate movement of Indo-Australian Plate. Did earthquake in China mentioned above indicate the bending/adjustment of Eurasian Plate in the sequence of Indonesia Sinking? if so, Can Zeta explain in more details? As noted in our explanation of the Hangzhou UFO sighting, which was seen from the airport at Hangzhou and down along the China coastline all the way to the Vietnam Sea, this coastline can anticipate participating in the 7 of 10 sinking of the plate tongue holding Indonesia. This is what is emerging. As we pointed out at that time, these regions were being warned about tsunami and a suddenly rising sea level as the plate tongue holding Indonesia is bent and pulled down. Note the path of the quakes you delineated, and they are along this path that was warned. This area of China is also subject to being bent, as the crust is not as thick as further inland, and as is known is having horrific sinkhole problems. How do you regard the interview between President Hu and Obama? Is it the peace flag between China and USA? [and from another] http://news.yahoo.com/s/ap/us_us_china President Barack Obama is looking to assure Americans that they should not fear China's economic rise, using Chinese President Hu Jintao's high-profile state visit to announce job-creating business deals worth billions of dollars to U.S. companies. These two giant countries - China and the US - have decided that the coming Earth changes are more important to address, as friends and allies, than trade agreements. That this new friendship is exhibited just a month after the 7 of 10 changes started taking effect in Indonesia is no accident. Both these leaders are clearly aware of our predictions, and the fact that the Earth changes are unfolding as predicted. Both these countries will be desirable places for immigration for citizens in those countries subject to flooding, or where great quakes will destroy the cities. China and the US have stable ground, at least until the New Madrid strikes the US, and have large borders to defend. Hu and Obama have obviously decided that going back-to-back, where each has the other's back, is better at this time. You may, if you wish, call this an outcome of our 7 of 10 predictions. Do all forcasts the Zetas make have to be 100% accurate. After all, they use historic records, measurements, observations and calculations in order to make their forecasts. Not all that much different from that we humans do, for our forecasts. Only they have very much better science, computers and intelligence than we do. We should not expect them to be God Incarnate. I have great sympathy for them in what they are trying to do for us. They must feel very misunderstood and attacked by narrow minded humans. [and from another] If Zeta's science is not exact in predicting the timing of the events, then the sequence of events and the underlying factors facilitating the world change are what matters in the prediction. However people are educated to see reported facts and results other than underlying factors, Can Zeta comment on this lesson of changing mindset? [and from another] As the Council of the Worlds mandates that an Element of Doubt must remain, I assume that this applies to the members of this Ning and maybe to even your own awareness. Thus I'm surmising that their predictions regarding 7 of 10 that all members seem to be "waiting to exhale" to happen are part of the process of this Element of Doubt. I personally have no doubts about what will happen just the sequence and timing but the Poleshift will occur absolutely. Does the need to maintain an Element of Doubt during the awakening process interfere with our prediction accuracy? No, as the Element of Doubt is maintained because the establishment will always engineer some excuse for any Earth changes, trying to negate the impact of our predictions. If NASA says one thing and Nancy says another, who is to be believed? Those who have a need to negate our words, those who do not have the personal courage to face the coming Earth changes and the fact that man is not alone as an intelligent species in the Universe, will cling to NASA's explanations. We have emphasized the sequence, the steps in the process because this is certain. We have detailed the last weeks, the pole shift itself, and are confident in our analysis. The exact timing is another matter as many factors can cause an acceleration or a delay. We stated with certainty that the 7 of 10 scenarios would arrive by the end of 2010 because we knew the Earth plates were already in a precarious position, just waiting for the nudge. We also knew the process, with a tipping Indo-Australian Plate freeing the plate tongue holding Indonesia, would be the first step. The flooding in Queensland, from the tipping plate, and the simultaneous start of sinking along the southern border of Java, showed this did occur. Why has our timing been off on the length of time it would take for the sinking to complete? Because, as Nancy has pointed out in her newsletters the plates are undulating. This has delayed the process, as when the Indo-Australian Plate tips up below Sumatra and Java, sinking occurs, the tongue sliding under the curve, but when it drops again due to undulation, the sinking process is slowed. This does not change the eventual outcome. How did we miss this, that undulation might occur? Undulation is like a vibration, a swinging back and forth, and once it starts it tends to continue until resistance, friction, brings it to a stop. One reason that all alien groups, all spirits in contact with mankind, and all valid prophets are restricted from giving the date of the pole shift is due to the inexact nature of any prediction. The factors that need to be taken into consideration are not in the dozens or hundreds of even the thousands. They are in the millions. If you were to predict when and where a tornado might hit during atmospheric turmoil you need only take into consideration a dozen factors. Planets on the move, clashing magnetic fields, the momentum that results, roiling magma, the magma rivers under plates that change their tilt, and elements not even taken into consideration which might suddenly make an appearance - all of this is involved. So we are not perfect, but the process, the eventual outcome, is predictable and certain. Could you please comment on the 2 day early arrival of sunrise in Greenland could the scientists be correct in assuming that it is the ice melt? [and from another] http://news.yahoo.com/s/livescience/strangeclaimthesunrose2daysearlyingreenland Of about half a dozen scientists contacted, most were unaware of the report, which was circulating on the Internet. They offered a number of hypothetical explanations, including an illusion caused by an atmospheric effect and conflicting opinions about whether global warming might be to blame for melting along the edges of Greenland's ice sheet. With less ice, Greenland's elevation may take a dip such that the sun would have less distance to travel before appearing over the horizon. Of course this is from the Earth wobble, which has gotten increasingly violent and extreme. Greenland is tilted toward the sunrise, on a daily basis, due to the wobble. This is normally not noticed except during such precise measures, as the exact DAY when the Sun is traditionally seen during the waning winter in Greenland. To assert that the reason for this is melting ice is absurd. A simple computation would show the absurdity. More than the ice sheet would need to be removed. The curvature of the Earth would have to be altered. A member of my family has directed my attention to the fact that Cuba is actually not part of the Caribbean, but riding on the edge of The North American Plate. Then I started researching. Elevation extremes: lowest point: Caribbean Sea 0 m highest point: Pico Turquino 2,005 m (Sierra Maestra Mountains near Santiago de Cuba). I have noted that almost all Cuba earthquakes are off the coast of Guantanamo on the other coast from the Sierra Maestra. I decided to pose this question, as Cuba per se is also not listed in the islands of the Caribbean list. With a height of 2.005 meters above sea level in the Sierra Maestra Mountains will it be possible to consider the Pico Turquino a possible safe loc for Cubans? Where Cuba will be relatively unaffected by the 7 of 10 scenario, where the Caribbean Plate tips and is pushed down on the southern end, it will not fare as well during the pole shift itself. Florida will lose 150 feet in elevation, and Cuba will scarcely fare better when the Atlantic Rift splits wide open during the hour of the pole shift. As can be seen from the shallow waters surrounding Cuba and Florida, these lands have been dragged down before, during prior pole shifts. During the New Madrid adjustment, Cuba will simply move with that portion of the N American Plate to the east of the Mississippi. Thus to compute safety during the pole shift, assume the need to be at least 825 feet above sea level in the Aftertime, and 350 feet above sea level during the hour of the pole shift while at a distance of at least 100 miles from the coast. Can the Zeta's comment on this recent story in the Toronto Sun regarding George Lucas, Seth Rogen and Steven Spielberg concerning a world tectonic shift in 2012? [and from another] http://www.torontosun.com/entertainment/movies/2011/01/18/ Funnyman Seth Rogen was left stunned by a recent encounter with his moviemaking hero George Lucas - because the Star Wars director spent 20 minutes telling him the world would end in 2012. Rogen was left speechless when Lucas and Steven Spielberg joined a movie meeting he was a part of - but the encounter has left him worried his life will be over next year. This is a case of two Star Children, both of whom are very aware of what is coming to the Earth, agreeing to play good-cop/bad-cop for the media. If both had asserted the end times were coming, the article would have been suppressed, the editor deciding it crossed the line in the cover-up over the presence of Planet X. But as Spielberg was taking the opposite posture, the debunking posture, it was able to be billed as an argument between two good friends. These two producers are known to be very good friends. And without question, they are both Star Children. This was also an announcement by Lucas that he intends to attempt to get his beliefs into film, in the coming months, or at the very least to be available for interviews on the subject. Spielberg also expects to be able to unearth film he has in his archives, updated somewhat, on the subject as now that it has been broached, he can expand upon it. In 2002 the zetas talked about imploding cities due to collapse of the infrastructure under skyscrapers but could not give any details on timing. ../xtime/x13.htm With the 7/10 events in mind, are they able to tell us whether they expect this to occur anywhere? Skyscrapers in cities along the top edge of the South American plate like Caracas and Panama City would seem to be at real risk of this happening but also what about the east and west coast of the US when the Pacific, New Madrid and Atlantic Rift adjust? This linked article indicates that the GPS system is having problems and needs to be recalculated or recertified as accurate. My question: Is this GPS explanation more cover up for the earth wobble or is this the result of lost satellites? Also, given the ZT on the Tampa Airport runway designation to "true north" this question would seem as an addendum to that message. It seems that the ruling elite may soon run out of excuses for satellite malfunctions as the cover up gets exposed for the truth. Can the Zetas expand on the real loss or disruption of satellites, not just those used for navigation, but perhaps some of those secret satellites with weapons, or those with spy glasses? The linked article also indicates that truckers in the midwest portions of the USA are reporting GPS going "haywire" but no solution is promulgated for that region as it is for the southeast USA. Those of us awaiting the events to unfold "before 2012" at least have the knowledge that such excuses were long ago predicted by ZT to be forthcoming as "reasons" for earth changes, and knowing of the planned excuses is a comfort and I have found the "planned excuses" to be a proving statement used in conversations; as months ago I have told my associates and close friends to watch for Indonesia to begin flooding and watch the news for "rain" as the excuse...way long before any of this was apparent. Are there any other "excuses" that all of us may be able to use in our daily conversations, to explain forthcoming earth changes to our loved ones while pointing out the obvious. I am getting a lot of mileage out of the rain excuse and seem to be getting the desired expressions and increased levels of awareness and curiosity from loved ones and associates alike. Of course the first excuse proffered when there is failure in technology is to point to a failure in the parts. There are endless parts that can break. The next excuse, a favorite of those trying to explain derailing trains and crashing planes, is human error. Some hapless employee is sacrificed and if he protests, it is the employee against the system, no contest. Even when all, or virtually all the satellites in the sky are malfunctioning, this type of banter will be offered. Just as with the sinking of land in Indonesia, where the excuse is rain, the truth about satellite failure will not come from the establishment. It is private citizens, with enough education to discern the truth and with Internet access who will blow this cover. Satellites fried by the Sun? But the solar emissions are quiet. Needing to be recalibrated? Then why does GPS only malfunction at a regular time, daily, when the Earth is in a wobble and the Sun seems out of position? That the atmosphere overhead is no longer as safe as in past years will also likely become dramatically evident one day soon when the ISS meets its demise. The public will instantly connect the dots and understand that if trash slinging about up there can devastate the ISS, then satellites are of course being bombarded.